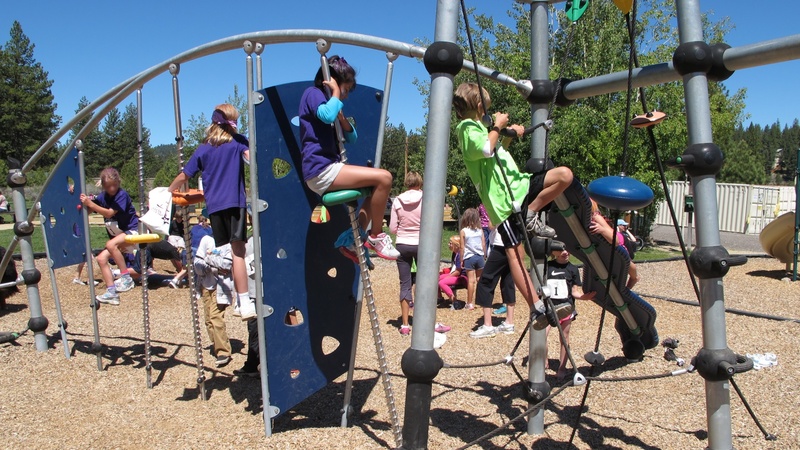 Girls on the Run – Sierras exists to “inspire girls to be joyful, healthy and confident using a fun, experience-based curriculum which creatively integrates running.” They host fun family running events twice a year on the Truckee River Legacy Trail [update: full trail description posted here]. Runs include a 5k fun run for all ages and a 10k race. I have run the events several times with and without our kids, and have always really enjoyed the experience. The October event is specifically a costume affair, while the June run is more of an “anything festive goes” type event. Last June I ran the 10k on a whim and was lucky to experience winning a race for the first (and probably last!) time amongst a small field of nine runners. In October our 7-year-old daughter, Clara, joined me in the 5k and we had a fabulous time running in fairy costumes. Clara wasn’t too interested in running the 5k this year until I suggested that she might wear her newly acquired (hand-me-down) dance tutu. That, combined with the incentive of several girlfriends from swim team also running, clinched the deal. Since Daddy had a long training run on the schedule this morning, it meant that our 5-year-old son, Alex, would be part of the team. All children runners must be accompanied by an adult runner. My charges for the run included four runners: Clara, Alex, and two of Clara’s girlfriends. They were some of the younger runners out there, as the school-based program accepts girls in grades 3 through 8. We registered on-site and received goodie bags and race bibs. Everyone in the 5k run gets race bib #1 – so much fun!! Race day turn-out was apparently higher than expected this year, as they ran out of #1 bibs (and later cups at the water station), but the volunteers improvised and everything seemed to work out OK. 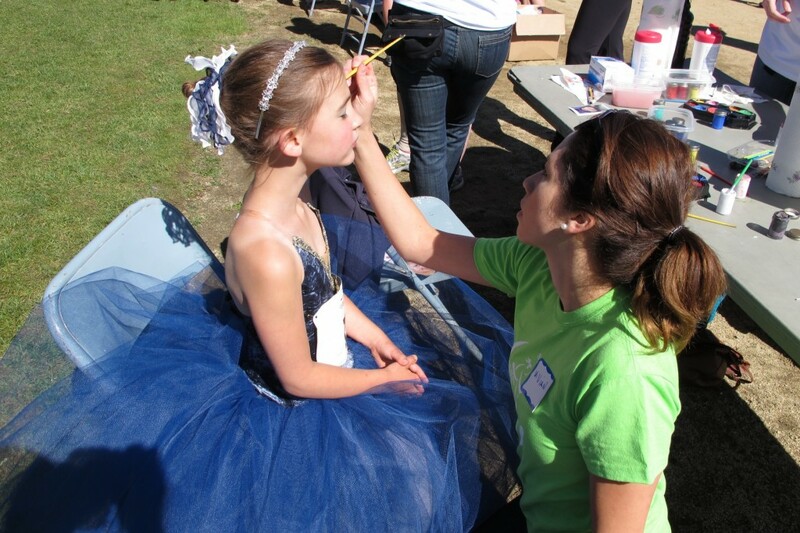 Volunteers help participants who arrive early enough by painting faces and decorating hair. Next, everyone is invited to warm-up with a short pre-race Zumba class. Clara and Alex skipped the Zumba warm-up in favor of the “playground” warm-up. The runs started at 10am, but it was definitely worth getting there at least an hour early to enjoy the festivities and play on the unique playground at the park. Both distances start and finish at Riverview Sports Park in Truckee. The course leaves the park on the dirt circling the sports fields toward a well-hidden connector to the Truckee River Legacy Trail [update: full trail description posted here]. The 5k course heads left toward Downtown Truckee, then turns around at the pedestrian bridge. The water station is positioned at the turn-around point. Today was warm and the course offers very little shade. I’m glad that I carried water for the kids – our team of four (plus me) easily went through two 20-ounce bottles. All of our little team ran for the first three-quarters of a mile. They seemed to enjoy the rush of a race start. Clara liked the attention that her tutu garnered, and both Clara and Alex enjoyed huge cheers from Girls on the Run Coach Denise Kowal. Once the crowd thinned we slowed to a walk, but I instructed the girls to run as soon as we saw their Moms on the course. They happily complied. Everyone is #1 at Girls on the Run! After that, we walked and jogged most of the way to the turn-around. Alex (our 5-year-old) took off ahead of us at the turn around. I spent about 10 minutes running back-and-forth – trying to confirm for sure if he was ahead of us or behind us. Finally I caught up with him and he was fine – not worried about us, as he was still in the midst of many familiar, friendly faces. He was certainly hot and tired by that point. The kids struggled to finish the last mile, which ends with a climb back into the park. Spectators and friends helped them rally, and they ultimately all finished with big smiles. All runners received t-shirts at the finish. Click here for an interactive map and GPS data for the Girls on the Run 5k course (June 2012). Click here for an interactive map and GPS data for the Girls on the Run 10k course (June 2011). This is a great family run at a beautiful and fun venue, and a wonderful way for the girls in the program to celebrate their potential. 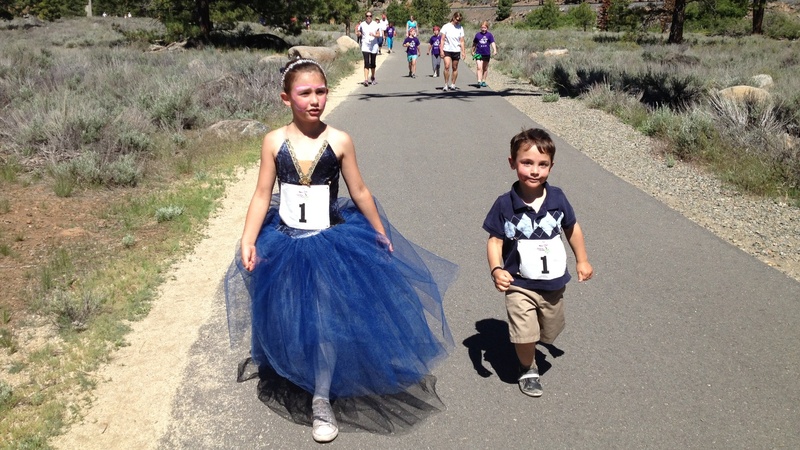 Alex was definitely at his limit with the 5k distance – I think it’d be even more fun if they would consider adding a very short course for younger siblings, as with the Truckee Running Festival. Medals are only given to girls in the school-based program. We might suggest skipping the t-shirts and instead supplying medals for all the 5k finishers. I highly recommend the 5k for families with children over the age of 5, and I also encourage you to learn more about and support Girls on the Run – Sierras. Thanks for writing up our event and supporting Girls on the Run- Sierras! I will take your suggestions for a shorter distance for younger children to our race committee for feedback. We had a lot more younger siblings attend this year than at past events. Thanks for hosting another great event and all that you do for girls in our community!